I did about two pounds of romas and, even though it took 22 hours of drying, these are wicked, wicked good, with just the right amount of spice and literally oozing with a deep, smoky tomato flavor. I almost can't wait for a cold, gray day in February to pull these tomatoes out of the freezer and rehydrate them in a creamy sauce with chicken over pasta. Almost. I need to buy a down coat first. Combine all ingredients except the tomatoes in a large bowl. Add tomatoes and marinate for at least several hours, preferably overnight, in the refrigerator. Remove tomatoes from marinade and spread out on dehydrator trays and dry until desired doneness (anywhere from 12-24 hours). 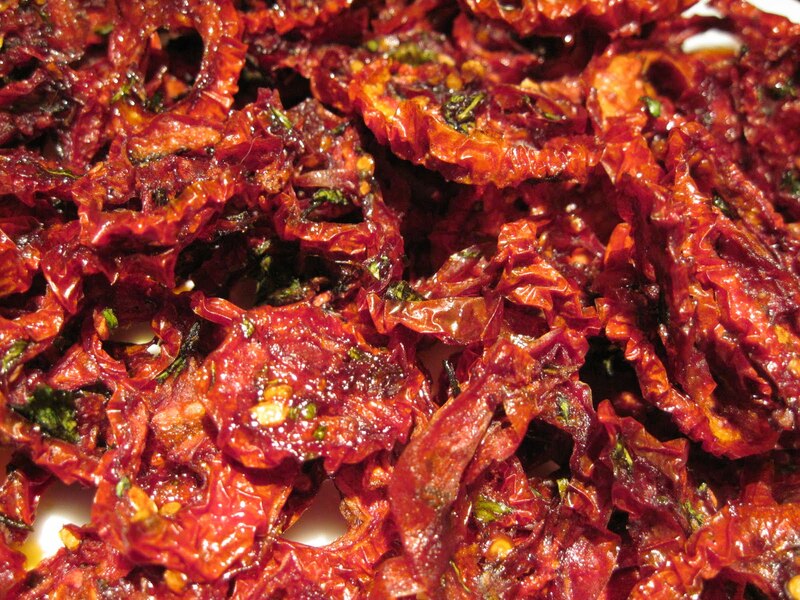 Store the dried tomatoes in the freezer to keep all winter. Must.Stop.Coming.Here. I always get so hungry!! These sound great, I'm adding them to my list. Ooh, I put a batch of tomatoes in the dehydrator this morning but I will need to try these next. Thanks for another great recipe! Yes, Michelle, you can. Most folks dry tomatoes in the oven at about 200 degrees, but it takes quite a while. The marinated version above would take even longer, because of the added oil. If you're crafty, try googling "solar food dehydrator" -- you will find lots of plans for building your own. And let me know if you try the tomatoes in the oven! I wonder if you could do half fresh red peppers. I love red peppers with tomatoes. I don't see why not, Matt -- sounds like a good combination. Give it a try!